You are here: Home / Climate / What would you do if all your models overestimated warming and a ship investigating Antarctic climate change was stuck in ice? What would you do if all your models overestimated warming and a ship investigating Antarctic climate change was stuck in ice? Forecasts predicting less global warming fail to properly take into account cloud formation, say scientists. The Earth’s climate is far more sensitive to carbon dioxide emissions than previously thought, heightening the likelihood of a 4C temperature rise by 2100, new Australian-led research of cloud systems has found. The study, published in Nature, provides new understanding on the role of cloud formation in climate sensitivity – one of the key uncertainties in predictions of climate change. Report authors Steven Sherwood, Sandrine Bony and Jean-Louis Dufresne found climate models which show a low global temperature response to CO2 emissions do not factor in all the water vapour released into the atmosphere. 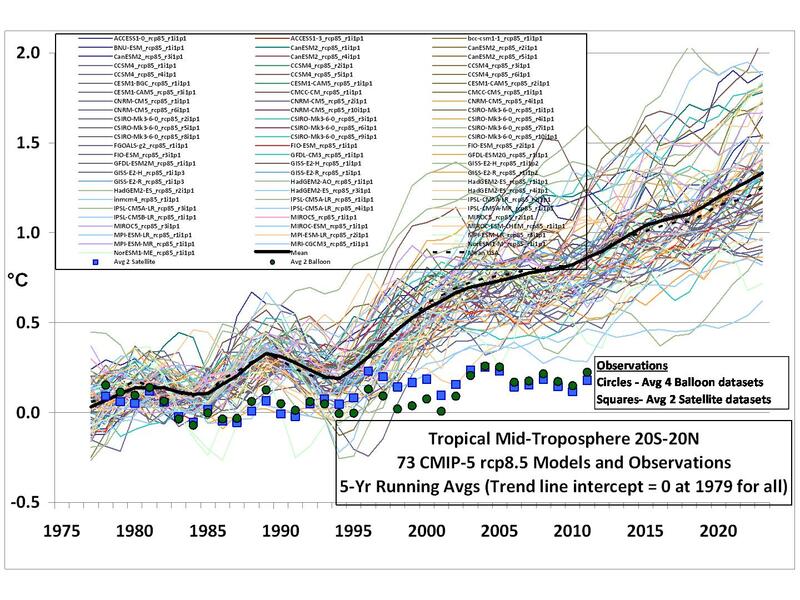 I’m having trouble seeing which of those models are predicting less warming that that which we have actually had in the last 15 years, since all of them comfortably exceed the satellite record. Wait, I forgot. Atmospheric temperatures don’t matter any more (despite being the most important measure of global temperature for centuries), having been replaced by the missing “ocean heat” – i.e. the “dog ate my warming” theory. From the UN down, the climate change delusion is a gigantic money tree. It is a tyranny that, despite its pretensions, favours the rich and politically powerful at the expense of the poor and powerless. But the madness of the crowds is waning and, as Mackay writes of the perpetrators: “Punishment is sure to overtake them sooner or later.” We can only hope it comes before most of us descend into serfdom. P.S. You can keep up with all the MV Akademik Shokalskiy hilarity at WUWT. Seeing that they are all down there and stuck in the thick ice then I hope that they don’t get bored and start to breed, God knows that we don’t need any more idiots. Going one step further, I hope that this turns into a mass extinction event, not of lives, but of reputations. These zombie scientists, 74 of them no less just on this ship, are costing the world $trillions. But on a more serious note, go to Louis Hissink’s Crazy World blog site to hear the outrageous spin that Chris Turvey is giving Fox News. I’ll be joining that conversation tomorrow. Right now happy hour beckons. LoL. Seems that the expanding empirical evidence that is surrounding the AAE is running counter to all of their hypothecations. NUFF said….. The only thing missing from this comedy is Tim Flannery. The irony of the Sherwood/Shokalskiy double feature is just too delicious. I could invoke the good old ‘head in the sand’ image, but it doesn’t even begin to register the prodigious scale of delusion. ……….. And ostriches deserve better company! The real reason the “scientists” are stuck in the ice is because Tony Abbott won the election. It’s his fault. He is also responsible for my minor liver problem and the fact my fridge has no beer in it, not to mention, my clothes not being ironed. C’mon all my greenie friends, back me up on this! Watched the channel 7 news tonight. The people awaiting evacuation were described as ‘tourists’ – just as expected. Channel 7 is as filthy as the ABC. The only difference is that they aren’t funded by the taxpayer. I still think they should be challenged on their deliberately false reporting. Unfortunately, It’s pretty certain that Turnbull won’t be doing that. Channel 7 got it partially right in that around half of the passengers were “science minded paying tourists” with media hangers on. I had to smile last night on the ABC news they described the incident as happening to a Rusian research ship. No mention of the Australasian Antarctic Expedition they so eagerly reported on over a week ago. The thing is Sean that they don’t have anything left except lies and scary stories for children and old people, Oh, they do still have their fake photos. Shouldn’t the title be ‘overestimated’? I think you mean “What would you do if all your models OVERestimated warming”. All models run hot. Alarmist: “Since they run much too hot, we have decided to not use the results of the ones that produce the more correct cooler results, and only use the ones that are the most in error. These models indicate that less cloud cover will occur”. I am reminded of “And to Think That I saw I on Mulberry Street” by Sr. Suess. Karoly is hardly someone to believe. He blamed the not-too-long-ago Brisbane floods on man-made global warming despite the National Oceanic and Atmospheric Administration denying global warming was responsible when attributing the floods to the :a Nina effect. Karoly is one of the priests of the “High Church of Catastrophic Man-Made Global Warming” that preaches “the science is settled” regarding the IPCC mantra … a mantra based on cherry-picked science to support a hypothesis they say is incontrovertible … and God help anyone who dares challenge it with credible real world observational data on climate. Q. How many climate scientists does it take to wedge a ship in Antarctic ice? A. None …. They’re all TOURISTS! The farcical theatre of warmist behaviour is bursting at the seams with material for the satirist. Of course, establishment orthodoxy has, thus far, stunted its development. There must be some frustrated main stream comedians out there, relying on tired old ‘denier’ gags to squeeze dutiful giggles from suspiciously familiar audiences. The more intelligent humourists will recognize the mother lode of material available from the ‘ground floor’ as the cAGW exaggeration becomes more transparent. Josh, of course, is one of these progressives and his latest ‘ New Year’s Eve Warmists’ Party – Josh 254′ cartoon @ Bishophill is a pearler. When I first heard of this expedition, I thought it sounded great, given the genuinely remarkable scientific achievements of Mawson’s expedition. Then, of course, the devil is in the detail, and now I see it’s just a bit of a holiday and waste of time/money. Climate activists might have enjoyed a white Christmas stuck in the Antarctic but according to the Bureau of Meterology and ‘their’ ABC 2013 was hottest year on record in Australia, which apparently proves climate change is real. But as usual there was no mention in the report that over the past 17 years there has been no statistical warming throughout the world and of course no mention that 2013 was one of the coldest years on record for the USA. So forget about ‘global warming’ … Australian temperatures alone are enough to prove climate change is real and the activists stuck in the ice are just nancy-boys who were in the wrong place at the wrong time! It would seem that, globally, Australia is a ‘hot spot’ helping to keep the global surface temperature at the 17 year approximate level. ie – counterbalancing lower temperatures elsewhere, (mainly) in the northern hemisphere. Recently, Antarctic ice extent achieved record levels. A reasonable question is: Did the climate models project this and how do they account for it in terms of the CO2 AGW hypothesis? For balance and credibility, BoM and the MSM need to address this conundrum.